In this episode we’re taking a look back at 2014 and our first year as a podcast. We share some of our favorite moments and we give a lot of thanks to our past guests, listeners and guest co-hosts. We also discuss the latest news including the extended Dino Charge trailer from Amazon, Ninninger announcements, Austin St. John thanking the fans, unreleased Ranger Keys and the unknown MMPR Spec short. Or is it a pilot? No one knows! We’re also hosting an epic contest for our anniversary with 5 prize packs up for grabs. The deadline is 1/15 and winners will be announced in our anniversary special on 1/24! Visit www.rangercommand.com/RCPHAnniversary for details. We also want to hear your thoughts and favorite moments from the show. You can tweet us at @RangerCommandPH, write on our Facebook wall at www.facebook.com/rangercommandpowerhour or send us a MP3 to rangercommandpowerhour@gmail.com. We're recording our anniversary show on 1/17 so please have your thoughts to us by then. One year. 32 episodes. We celebrate the only way we know how, by getting Ranger Nation involved. We talk about your favorite moments of the show (with clips), hear shout outs from some of our favorite listeners, and have questions asked of us. We also discuss the latest news including the premiere date for Power Rangers Dino Charge, new Legendary Ranger keys, the Ranger returns, Zyuranger DVD set from Shout! Factory released a month early and a very special call to action for a Ranger in need. Finally, we announce the winners of the RCPH Anniversary contest. Thanks to EVERYONE who listens to our show. Here's to many more years! #RangerNation Spotlight returns for our next episode recording this Saturday and releasing February 7th! We will be talking to @hassanahmed120 of theworldofHA.com and #PowerForce member. If you have any questions for him, please comment or tweet us. Today we have a special #RangerNation Spotlight with Hassan Ahmed, also known as @hassanahmed120 on twitter and HAVortexDude on YouTube. Recently, he has rebranded his channel and launched a new website called The World of HA. His channel includes Power Rangers Toy reviews, Pentatonix videos, vlogs, unboxings, gaming videos and more. Hassan is the podcast director for NintendoFuse and also one of the new members of the Power Force. Most of the episode though is talking about the premiere episode of Power Rangers Dino Charge, "Powers From The Past"! We also discuss the latest news including Rajia Baroudi's cancer fund update, Power Rangers Dino Charge Theme Songs Available on iTunes and Amazon.com, Legacy Tigerzord and Saba spotted for the first time in the U.S. and we answer your questions from #RangerNation! Tune in tomorrow for a bonus episode when trekkieb47 and Kickback have their own discussion regarding Power Rangers Dino Charge. Enjoy! In our first Extra Episode, we present "Kickback Says: Dino Charge" where host @trekkieb47 talks with @rankal aka Kickback from Tokunation.com and the Talkin' Toku podcast about the premiere of Power Rangers Dino Charge. In this hilarious and unbleeped episode, Eric and Chris dive right into analyzing the best Power Rangers premiere episode in easily a decade. Last year, I was fortunate enough to go to Toy Fair New York. This year, we are partnering with TokuNation‘s Talkin’ Toku podcast for a special LIVE episode early Saturday morning (2/14 AT 9AM EST) with an exclusive look at the latest toy offerings from Bandai. Then, on Sunday 2/15, we record with @rankal to talk about all of the Toy Fair reveals, the second Dino Charge episode, and more. That episode will release on 2/21. Are you CHARGED for new toys? Toy Fair 2015 was last week and a lot was revealed! We are joined by frequent guest co-host Chris (aka Kickback @rankal) of TokuNation.com. His team got the first look of Bandai's booth at the show and we discuss all of these findings. We also discuss the second episode of Power Rangers Dino Charge, "Past, Present and Fusion". What did we think? Listen to our take on the Shelby, Kendal, and Koda "situations" brought up by Ranger Nation. As always, we discuss the latest news including Rajia Baroudi's cancer fund update, Rangerstop's Superhero Toy & Comic Con guest announcements, the newest Dino Charge episode descriptions, Dino Charge not being on Hulu, the Threadless Power Rangers design contest winners and we answer your questions from #RangerNation! 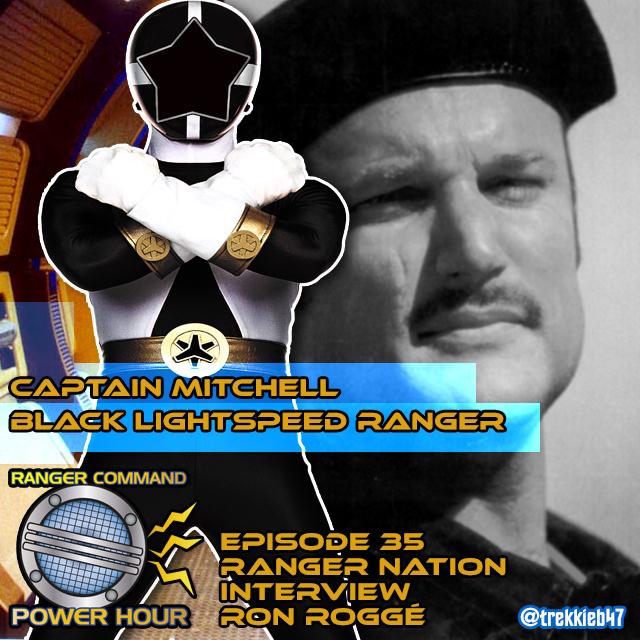 We are pleased to announce that we will be interviewing Ron Rogge aka Captain Mitchell of Power Rangers Lightspeed Rescue tomorrow evening for our 35th episode! Submit your questions now! Tomorrow evening (3/3) we are interviewing Dan Southworth! Ranger Nation, have any questions for Quantum? Let us know and they'll be read on show! This weekend, it's a double interview weekend! Ron Rogge on Saturday and Dan Southworth on Sunday. Today we are interviewing Ron Roggé, best known in Ranger Nation as Captain William Mitchell from Power Rangers Lightspeed Rescue. He has starred in numerous television shows, most recently in "Sleep Hollow", Amazon's "Man in the High Castle", "Modern Family", "The Middle", "Devious Maids" and the feature film "The Activist". He reveals his Power Rangers Dino Charge connection, his opinion on the direction of Sleepy Hollow, his time on the set of Lightspeed Rescue, what color ranger he would be and more! 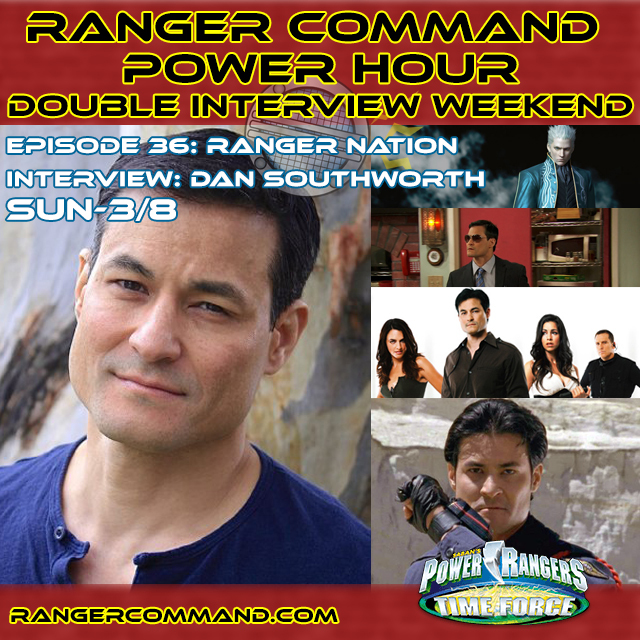 Come back tomorrow when release Episode 36 interviewing Dan Southworth in our Double Interview Weekend! Today we are interviewing Dan Southworth, best known in Ranger Nation as Eric Myers, the Quantum Ranger in "Power Rangers Time Force". He is an accomplished actor with wide experience in feature films, television shows, motion capture, voice over, and commercials. He has devoted more than ten years of training to the craft of acting, including five years with famed acting coach Ivana Chubbuck, and honed his skill at action with film director Andy Cheng, originally a member of Jackie Chan's Hong Kong stunt team. He also helped develop action sequences for Terrence Malick's "The New World", took part in James Cameron's early visualizations of "Avatar", and developed action for Neill Blomkamp's "Halo 3: Full Combat" web sequences. Most recently he’s appeared multiple times in Disney's "Kickin' It", portrayed Kenshi in "Mortal Kombat: Legacy", played the lead role of Mark Leonard in "Divergence" as well as writing and producing that series. Dan is popular among anime and video game fans for his role as Vergil in "Devil May Cry 3" and "Devil May Cry 3.5", which was was released so that fans could experience the game as Dan's character. We talk about all of these projects and he answers your questions from Ranger Nation! Last edited by trekkieb47; March 8th, 2015 at 07:27 AM. Just got back from Lex Con! So, it's time for our #RangerNation Answers question! What was your favorite moment of @lex_con #LCTC2015? We will read your answer on the show! It’s time to Ranger Up with @trekkieb47 @secretrangerfan & @TheCinemaSlob as they talk all things Power Rangers on the Four Eyed Radio Network with Ranger Command Power Hour​! Eric reminisces with Jordan (DenO), RJ (Uchi), Matt (PRGenerations) and Grant (RangerGrant) about the Lexington Comic & Toy Con​ that happened last weekend. They discuss their favorite moments of the convention, their con hauls and more. Then, we give you the very best highlights of the Lex Con Power Rangers panels! We've included timestamps to make it easier to listen to a specific panel's highlights. For full panels, please visit Lex Con's official Youtube channel. Special thanks to the Lexington Comic and Toy Convention for providing us with Press access for the weekend. Last edited by trekkieb47; March 25th, 2015 at 07:54 AM. In our first monthly extra episode thanks to our Patreon supporters, Eric and Zach talk Ranger cosplay with Chris Cantada. Chris Cantada is a Cosplayer from the Philippines whose YouTube channel (Chris Cantada Force) has over 18,000 subscribers and over 2 million views. He cosplays Power Rangers, Star Wars and Ninja Turtles. On his channel he has done Power Rangers drum covers, toy and episode reviews, cosplay skits and more. Currently, he is an actor in the Philippines independent series called MYTHOS, releasing later this year. This extra episode is brought to you by our Patrons on Patreon. Go to Patreon.com/RangerCommandPH to learn more about supporting Ranger Command Power Hour. The gang is back! After a crazy March, two interviews, a convention and a bonus episode we talk about all of the Dino Charge episodes released so far. From "A Fool's Hour" to "Let Sleeping Zords Lie", we give you the complete rundown. In the News we discuss the Power Rangers Unite game, Dino Charge and the Rockettes, independent films from Michael Copon and Austin St. John, Drink Blocks and more! Then we answer your questions for us in our "Questions from Ranger Nation" segment and you tell us your thoughts on Dino Charge in "Ranger Nation Answers". Today we talk with Michael Andrew Buoni (@RangerStop_com), Mike Valdes (@mjvaldes84), and Jonathan Sepulveda (@JonimusPrime) about The RangerStop’s Superhero Toy & Comic Con 3, November 13-15 in Orlando, FL. Also joining us is Susan Matisi (@Suzy_Q_Matisi), who runs the annual Power Rangers After Dark panel. How did RangerStop get started? What's can con goers expect this year? Why is RangerStop so awesome? Then, in a RangerStop EXCLUSIVE, we announce RangerStop's newest guest and interview him. Want to know who it is? You'll just have to listen! Finally, we talk about who would be on our Ranger team if we were stuck on a monster infested island and include some fun bloopers at the end. This November, Ranger Up at Ranger Stop! It’s time to Ranger Up with @trekkieb47 @secretrangerfan & @TheCinemaSlob as he talks all things Power Rangers on the Four Eyed Radio Network with RANGER COMMAND POWER HOUR! 10 years. This year, Power Rangers SPD celebrates its 10th anniversary. It's no secret that all of us on Ranger Command love the series. Join us as we talk about our favorite episodes, dive into trivia and also find out what our audience thinks in our largest Ranger Nation Answers segment to date. We also talk about the newly announced director for the MMPR Reboot Movie and have some fun discussing the new mobile game, Power Rangers Dash! Tonight we are interviewing Zordon himself, Mr. David J. Fielding! Post your questions now!